Lets Culinate ! : Mirepoix /Soffrito: Cooking With A Plan ! Mirepoix /Soffrito: Cooking With A Plan ! Have you ever tried to start cooking without a plan? You switch on the gas pour some olive oil as you chop your onions then you remember I have some celery,carrots, ginger and garlic can use some of that, your oil is super hot when you put your onions within no minute they turn black. Mirepoix, raw, roasted or sautéed with butter or olive oil, is the flavor base for a wide variety of dishes, such as stocks, soups, stews and sauces. Next time before you start cooking think of what you want to cook and prep first before you get to the unnecessary frenzy runs in the kitchen. Let me now take you through how to make your mirepoix. Mirepoix was first made in the 18th century by the cook serving a French duke called Duc de Lévis-Mirepoix, hence the name. It is basically a mixture of diced vegetables used to improve the flavor of meat and poultry dishes. It can also be used as a garnish to accompany vegetables, macaroni and cheese, or other baked cheese dishes. The chopping is not difficult you just need to master some basic knife use techniques(which will be the subject of another blog post).How you chop your aromatics the shape,look texture will matter a lot and will not only enhance flavor but identify your skill as a fine cook.Small finely cut dices are the best. You must also master use of heat and understand what we call sweating of vegetables.High heat may destro flavor, slow heat works best but one must make sure that the mirepoix is sizzling and not boiling, enough heat is necessary to get by and caramelize the sugars in the vegetables. 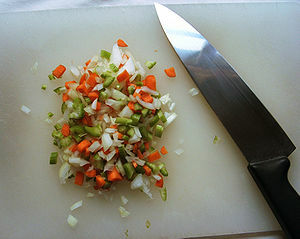 To make your own mirepoix, chop 1 cup onion (about 1 medium onion), 1 cup celery, and 1 cup carrot. Sauté it in 1 Tbsp olive oil until onions are soft, and you've got the start for many soups, sauces, and stews. You can various aromatics depending on what flavours you want to infuse to your food. The shorter the cooking time of your recipe, the smaller the pieces should be, so that they effectively infuse the foods with flavor. Modern "informal usage" of the word mirepoix has acquired a wider meaning(similar to 'Mise en place' french word for everything in place common in professional Kitchens) to basically include all that is required in preparing(chef term prepping) your aromatic vegetables ,ingredients …et al before you start cooking, If you already have a recipe at hand, gather, measure all the necessary equipment and ingredients before you start cooking. It is important to note this basic truth cooking is basically changing the chemical composition of food. And just like any scientific process the right conditions need to be present to achieve the desired effect. Consequently having everything ready and in the proper composition makes one cook excel better than the other. Preparing your equipment and ingredients(make sure if anything needs slicing ,dicing, chopping, peeling, sharpening , warming, thawing… etc that it is done before you begin the process). This gives you time to concentrate on the actual cooking, having time to regulate the temperatures, avoiding a messy kitchen and simply be able to get the desired flavours. 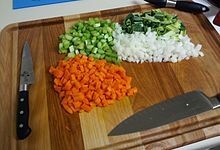 Mirepoix is a basic requirement (cooking 101); as mentioned before here at LetsCulinate,we will ensure that even if you have the list bit clue about cooking-your skills and culinary journey takes an exponential hike. Keep it locked here for further insights! So folks next time cook with plan and cook fiercely-to learn just how to keep it locked here ! Mmmmhhh very informative. I now know the key of avoiding a messy kitchen and running around looking for ingredients and items. Thanks Collins will keep it locked.